A handmade work of Chinese art, with a tradition going back thousands of years. This pot is made from rare "zi sha" clay ("purple sand"), which is found only in the city of Yixing, in Jiangsu province. These often elaborate and whimsical pots are traditionally used for gongfu steeping, where tea is served in small cups over the course of many very short infusions. Ideal teas for this are oolongs and pu'erhs, although some black teas will be quite lovely, as well. The unglazed tea pot will become "seasoned", absorbing the rich tea oils over repeated use. So no matter which tea you choose, it's recommended to dedicate a Yixing pot to a particular type of tea for best flavor. Perfect for foodservice, restaurant and other professional industrial uses. Bulk pricing available through Adagio Wholesale. One of our more popular items. Sturdy glass walls convey the beauty of the brewing process. And a large infuser chamber gives tea plenty of room to unfurl and fully infuse. Placing more flavor in each cup. Dishwasher safe. Perfect for foodservice, restaurant and other professional industrial uses. Bulk pricing available through Adagio Wholesale. Made in China. 42oz. 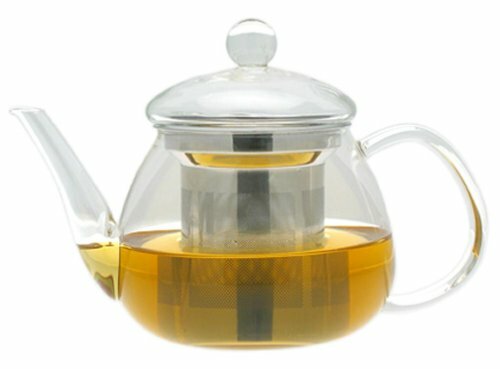 Enjoy loose tea anytime with this elegant ceramic teapot. A large infuser basket provides ample room for the leaves to unfurl and infuse fully. Perfect for foodservice, restaurant and other professional industrial uses. Bulk pricing available through Adagio Wholesale.